Amazon Prime Music: It's no Spotify, Beats, or Pandora, but doesn't have to be. Amazon’s New Music Service Can’t Compete With Spotify. But It Doesn’t Have To. Amazon’s new music service isn’t very good—but it’s still a nice perk for Prime members. 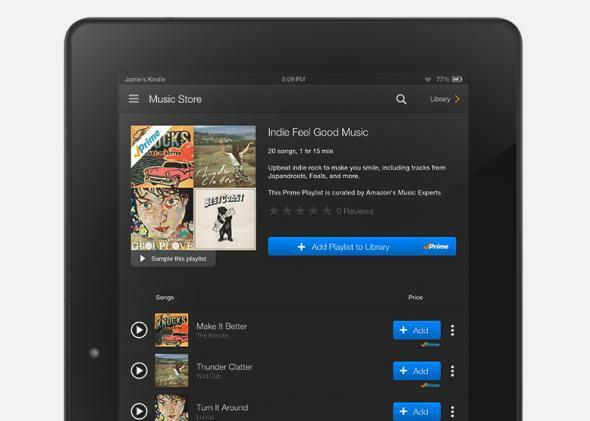 On Thursday, Amazon released Prime Music, its long-rumored streaming music service. For Amazon Prime members, that means about a million songs by a variety of popular and not-so-popular artists are now free to stream anytime from Amazon.com, without commercial interruptions. Prime members can also download the songs onto their mobile devices and play them offline via the Amazon MP3 mobile app, though they can’t do the same on their computers. If you already have Amazon Prime, this can only be good news. If you don’t, however, you can ignore it entirely, as I’ll explain. Prime Music is Amazon’s belated entry into an increasingly crowded field—and it’s a desultory one at that. If you were hoping for a Spotify-killer, you can put that out of your head right now. The biggest problem is the puny selection. A million songs might sound like a lot, but it’s a small fraction of the number offered by rival services like Spotify, Beats Music, and Rhapsody. That discrepancy makes a world of difference. On Spotify, you can search for just about any song you want to hear, and most of the time you’ll find it. On Amazon, searches are crapshoots, especially since its library is light on new releases by popular artists and doesn’t include artists from Universal Music Group at all. That means no Kanye, no Katy Perry, no Lady Gaga. Amazon’s service also falls short as a radio player. There are no personalized playlists, a la Pandora or Beats, and its human-curated playlists at this point are nothing to get excited about. Instead, you’ll have to content yourself with browsing Prime Music’s featured selections, which is almost certainly the least convenient way to use a streaming-music service—especially when it’s so light on new releases. That said, those who already Prime members are unlikely to gripe too much about unlimited, ad-free access to big chunks of Bob Dylan, Johnny Cash, OutKast, or Prince’s catalogs. Here’s the thing: Amazon isn’t really competing with Spotify et al. At $99 a year, Prime Music makes no sense as a standalone streaming service. The company’s real goal here is to add a little more value for the Prime members who butter its bread—and, potentially, for buyers of its forthcoming smartphone, who will likely get Amazon MP3 as a native music app. Remember, Amazon Prime already has some 20 million members, which is twice as many as Spotify. If you’re among them, you may see Prime Music as another reason not to leave. If you aren’t, you might see it as one more enticement to join.